Another Nigerian judge ransacked and detained during the State Security Service crackdown on senior judicial officers has written to the Chief Justice of Nigeria, Mahmud Mohammed, stating how the Minister of Transport, Rotimi Amaechi, allegedly tried to manipulate him. Inyang Okoro, a Supreme Court judge, whose home in Abuja was amongst those raided by masked SSS operatives on October 7 and 8, said security agencies came after him because he turned down pressure to help influence the outcome of the Supreme Court ruling on Akwa Ibom gubernatorial election. In a letter dated October 17, 2016, and addressed directly to Mr. Mohammed, Mr. Okoro said operatives lured him to open his gate late at night using President Buhari’s name. “On Friday, October 7, 2016, at about 9:00 p.m., I received a phone call from an unfamiliar caller. He introduced himself as an official from the presidency. “He told me he had a letter for me from Mr. President. I immediately left my study room and went to open the door. Upon the door being opened, I saw so many heavily armed men with an inscription “DSS” on their uniform. One of them who was in mufti told me they were to search my house. “I requested that I be allowed to inform the Chief Justice of Nigeria but they rebuffed, rather, they seized my phone from me,” Mr. Okoro said. The letter, first published by Sitippe.com, is the latest in the emerging fallout of the SSS raid, which was conducted between late Friday, October 7, and early Saturday, October 8. The raid saw scores of SSS operatives swoop on the premises of the judges arresting some of them. The move, which the SSS described as a ‘sting operation’ in a statement, was conducted in Abuja, Enugu, Gombe, Kano and Port-Harcourt. Seven allegedly corrupt judges were arrested in the raids while attempts to arrest more were frustrated. Mr. Okoro’s letter came a few days after his junior colleague, Adeniyi Ademola, wrote a similar one that was also addressed to Mr. Mohammed. In his, Mr. Ademola blamed the Attorney-General, Abubakar Malami, for his own ordeal and said the SSS operatives frightened him with their firearms. After narrating the initial tactics of the officer, Mr. Okoro went on to detail the items taken from his premises which he said included a unit of iPad, three phones, $38,800, N3.5 million and four chequebooks. He said he signed the items declaration form presented to him by the SSS after the raid. Unlike Mr. Ademola, he did not say he was forced to sign at gunpoint. Mr. Okoro, however, said the operatives refused his appeal to allow him sleep in his home and visit their office in the morning, adding that the guns they were holding also made it difficult for him to argue with them. Mr. Okoro said they asked him to explain the source of funds found in his home. “I told them that having received the sum of $24,000 and £10,000 a year for the past three years of my sojourn in this court as annual medical and vacation allowances. And having spent more than £5,000 on each of the three trips I have so far made abroad, I was entitled to have more than the amount recovered from me. Mr. Okoro said all the money was quite outside the estacodes he had received for the international conferences he attended since joining the Supreme Court. He told Mr. Mohammed that up till when he was writing his letter on October 17, exactly 10 days after the raid, the SSS has not confronted him with any petition or complaint from any quarters. Specifically, Mr. Okoro accused Mr. Amaechi of being behind his ordeal. The senior jurist recounted how Mr. Amaechi allegedly visited him in the run-up to the Supreme Court decision on the appeal about the outcome of the Akwa Ibom governorship poll in 2015. The election pitted incumbent Emmanuel Udom of the Peoples Democratic Party against Umana Umana of the All Progressives Congress, who also allegedly visited the judge. Mr. Udom won the election held on April 11, 2015, and the Supreme Court upheld it on February 3. Mr. Okoro said the outcome would have been different if Mr. Amaechi had had his way. 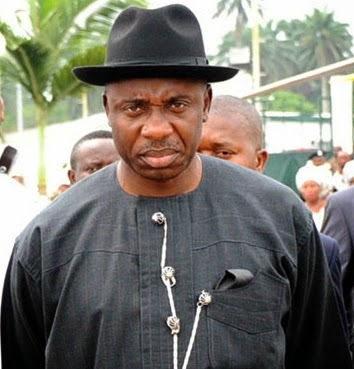 The judge said he strongly believed that this his travail is not unconnected with a verbal report he had informed the Chief Justice about on February 1, 2016, to the effect that Mr. Amaechi visited his official residence. Mr. Okoro said Mr. Amaechi approached him and said the president of Nigeria and the APC sent him to plead with the judge that they must win their election appeals in respect of Rivers State, Akwa Ibom State and Abia State at all costs. “For Akwa Ibom State, he alleged that he sponsored Umana Umana, the candidate of APC for that election and that if he lost, Akwa Ibom appeal, he would have lost a fortune,” Mr. Okoro said. “Mr. Amaechi also said that he had already visited you and that you had agreed to make me a member of the panel that would hear the appeals. He further told me that Mr. Umana would be paying me millions of naira monthly if I cooperated with them. “Mr response, as I told you on that date, was that it does not lie within my power to grant his request and I would do all within my power not to be in the panel for Akwa Ibom State. My Lord, graciously left me out of the panel for Akwa Ibom State,” Mr. Okoro said. But Mr. Amaechi flatly denied the allegations on Wednesday night.